Extracted from the public domain book "The United States Army and Navy." Colorized courtesy of Algorithmia. 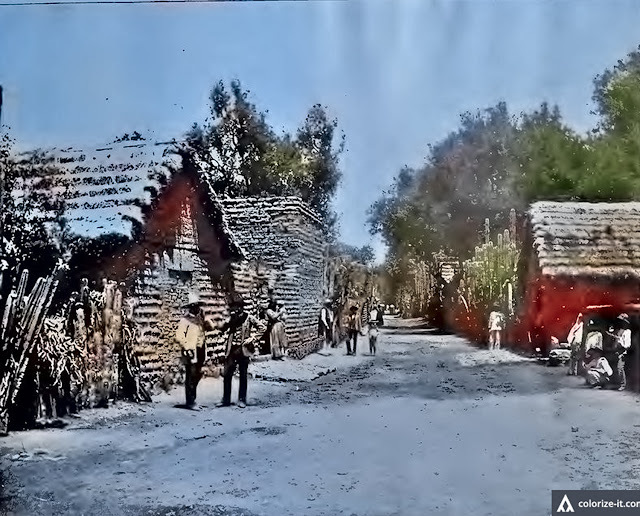 The colorized picture above has been extracted from the public domain book “The United States Army and Navy: includes Cuba, Puerto Rico, the Philippines and Hawaii,” published in the United States in the year 1898. It was captioned in the book as “Street Scene in Batangas. The picture must have been taken around the time the fleet of Admiral George Dewey was laying to waste the Spanish Navy at Manila Bay, essentially paving the way for the American annexation of the Philippines. Below is the original sepia-toned photograph after its extraction from the digital book, processed with graphic software to improve clarity. Extracted from the public domain book "The United States Army and Navy." The above photographs were extracted from “The United States Army and Navy: includes Cuba, Puerto Rico, the Philippines and Hawaii,” published 1898.